Leonard Greenwood Retter was born on the 19th December 1878 the fourth of six sons in a family of 13 born to Frederick Charles and Martha Annie Retter. 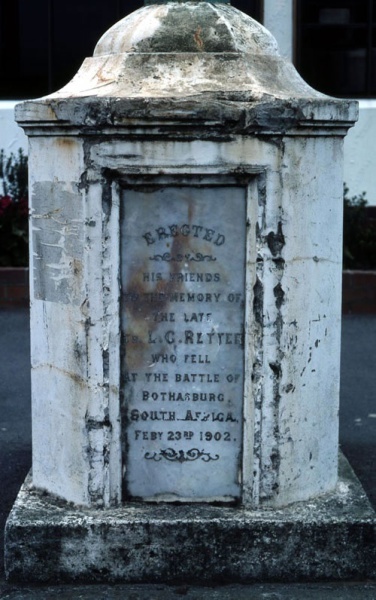 The Retter family were early settlers in Wellington with Frederick Charles Retter being born in Wadestown, Wellington, in 1849. Frederick Charles married Martha Annie Smith in 1870 and he ran a blacksmith shop in the main street of Johnsonville, Wellington. As the family grew up the boys also became blacksmiths with the eldest Frederick William Retter establishing another shop, in 1894, in Main Road, Johnsonville. Blacksmithing ran in the family as three of Frederick Williams younger brothers, Claude, Leonard and Darcy all being listed as farriers when the enlisted in the New Zealand Mounted Rifles to serve in the 2nd Anglo-Boer War (1899 – 1902). Farriers were vital keeping horses well shod and able to be used in the very mobile cavalry campaign that the New Zealand Mounted Rifles were committed to. (Len) Leonard’s older brother Claude had enlisted in the 4th Contingent and was in South Africa when Len and Darcy both enlisted in the 7th Contingent, New Zealand Mounted Rifles. Len’s enlistment papers, signed on the 13th March 1901, noted that he was working for his father as a blacksmith. [i] On the 6th April 1901 SA 4645 Farrier Len Retter, his younger brother SA 4644 Farrier Darcy Retter, SA4207 Trooper Charles Robertson, SA4643 Trooper John Robinson from Johnsonville, SA4605 Lance Corporal Joseph Brown from Tawa, SA4650 Trooper George Styles from Pauatahanui and SA4657 Trooper Leo Gestro from Paremata all sailed as part of the 7th Contingent for South Africa. On arrival in South Africa the 7th New Zealand and the 6th Queensland Contingent were assigned to Colonel Garratt’s column operating in the Eastern Transvaal and north-east of the Orange Free State. During June 1901 there was constant skirmishing with the Boers with casualties inflicted on both the 6th and 7th at places like Blesboxspruit, Kaffir’s Spruit. In July 1901 the captured a Boer commando at Koppjiesfontein where 11 Boers were killed or wounded, 25 captured along with 34 waggons, 31 carts and 1240 cattle. with Len in the trench at Bothasberg. 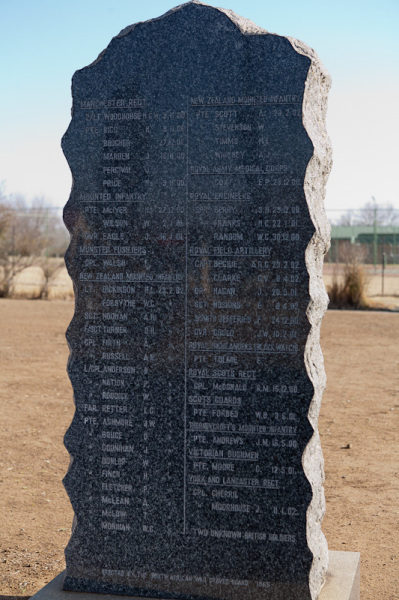 members of the 7th in Vrede Cemetry, Vrede, Free State, South Africa. 1901 clasp and provincial clasps for Rhodesia and Transvaal. The memorial, suitably given the families trade, was a cast iron lamp standard that originally powered by kerosene, then by gas and finally by electricity. The memorial was moved in 1985 and now stands in Moorehouse Avenue, Johnsonville. for veterinary and blacksmith skills. stories the rank of Trooper has been used.